Recently, Benchmark Foam supplied its Insulated Concrete Forms (ICFs) to multiple locations on the Standing Rock Indian Reservation for multi-family housing units. The project was enacted to allow residents the opportunity of affordable housing in an already limited housing market. The project included five, fourplex housing units at three different locations. 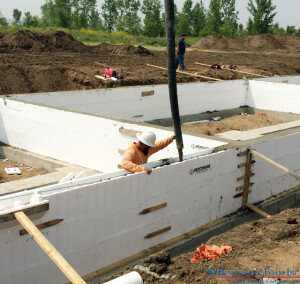 Due to its On-Time Guarantee, Benchmark Foam was an ideal candidate to supply the ICFs as scheduling was complicated to accommodate travel time for crews to move between three locations. Standing by the agreed-to delivery date, Benchmark Foam was able to deliver the contractor’s exact needs as required to keep each project on schedule. 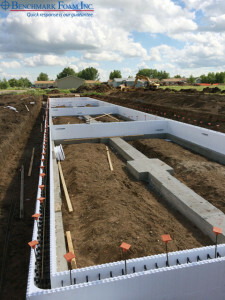 Each fourplex was specified to be built with concrete forms and a modular home, with the requirement that a representative would be onsite during installation to ensure proper setup. Benchmark Foam often offers this onsite assistance for first-time users that may have questions once installation begins. This complimentary service is just another benefit of buying ICFs from a Midwestern manufacturer. With the only On-Time Guarantee in the industry, Benchmark Foam offers the best in quality, service and value for you and your customers. Give us a call today at 800-658-3444 to learn more about the Standing Rock project – or to find out how Benchmark ICFs can work for your next project.